All to often on our site, we discuss issues in cybersecurity. Faceless threats that operate on the internet to wreak massive collateral damage. This doesn’t mean cyberattacks are the new way of violence and crime in society. Terror attacks, crimes and accidents still take place in the real world. What has changed however, is how security services providers can meet unchanging needs amidst the changing manpower and technology landscape. 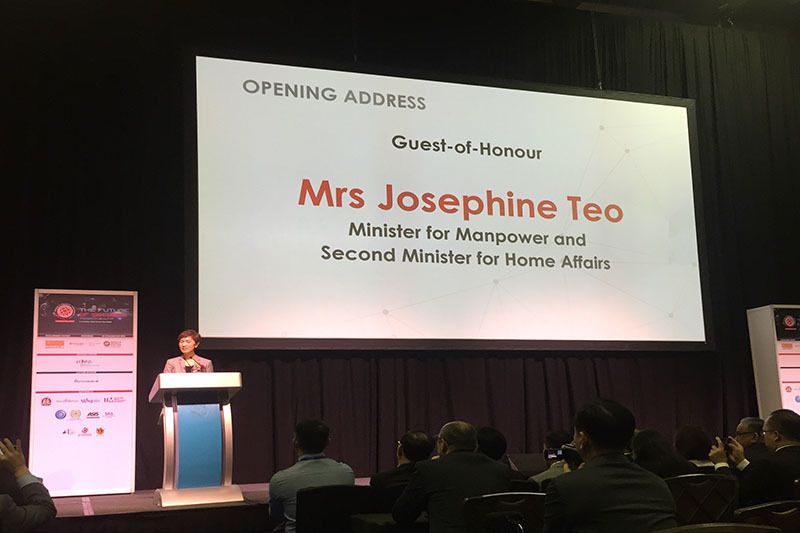 In an opening address, Minster for Manpower and Second Minister for Home Affairs, Mrs Josephine Teo, attested to the need to “re-imagine how security services are delivered to meet these challenges”. She was speaking at the Security Industry Conference 2018, held at the Marina Bay Sands Expo and Convention Centre. Modernising security means relooking age-old practices and leveraging on what technologies can bring. Traditionally, possessing a high level of security meant having multiple pairs of eyes and brains monitoring a person or place. Throw in a couple of surveillance cameras, and you were pretty much set to go. However, the Minister said that as Singapore continues to develop and add buildings in its urbanity, more assets are needed in security services. With threats ever evolving, manpower alone is insufficient. In fact, the Republic’s security sector has been facing a manpower crunch. Moreover, recruiting new security officers is difficult because other industries offer better wages, work conditions and career advancement. Opposing demand and supply forces beckon the use of technology. Machines equipped with artificial intelligence can improve the quality of service and is less reliant on manpower. Efficacy of machines will not deem human labour and intelligence void. Displaced workers can be upskilled and those with higher qualifications will have the opportunity to take home higher pay. Thanks to technology, employees in the security sector will also have better working conditions with technology shouldering a larger part of the traditionally labour-intensive duties. The manpower crunch in the industry is an important allude to how the sector transformation in Industry 4.0. “All security services start with a contract between the client and the security agency. This contract sets expectations of how security services are to be delivered, which in turn shape what services providers can do. In other words, contracts define the boundaries of what the future of security can be. Just think about that. What the future of security will look like can sometimes be very dependent on just how the contract is done,” remarked Minister Teo. Instead of competing to provide the lowest per headcount cost, vendors should consider differentiating services using technology. Not only is this a value add to the vendor by reducing overheads, the intelligence provided is far superior than what a group of security officers could achieve, regardless of the level of their expertise. Admonishing the competition for rigid headcount requirements as a vicious cycle, the Minister warned that such competition will stifle innovation. The Singapore Government will lead by example in modernising security contracts. First, it will take the lead in adopting outcome-based security contracts. Outcome-based contracts necessarily entails cost-savings, efficient and equitable manpower allocations, employing technology solutions, while better responding to security incidents. It is hoped that the Government’s commitment to adopt such contracts in its own organisations will encourage more private sector service buyers to follow suit. Every year, over SGD 350 million is generated from security contracts from government agencies. Private sector buyers who want to adopt outcome-based contracting may also receive some government funding under the Smart Sourcing Initiative. Plans for its expansion are currently underway. Second, the Government will provide resources and training for private sector procurement and security officers. Supported by several SkillsFuture Initiatives and institutes of higher learning, this group of workers will be upskilled in preparation for Industry 4.0. Third, the Government will ensure a ready pipeline of new technologies which can be incorporated into outcome-based security contracts. Earlier this year, the IMDA-MHA Call for Innovative Solutions was launched. The SGD 2.5 million initiative partners technology providers with service buyers to co-develop solutions which are not widely available in the market. Four pilots have been awarded.